Like all of the NAR data, that’s a bald faced lie. Sales were down 120,000 units month to month (30%) to 284,000, and I’m pretty sure even that’s a lie. How they used a seasonal adjustment to turn that into a gain, I can’t imagine. Who’s running that mob, Kakadaffy? It’s simply incredible that they would post this kind of garbage after getting caught having massively fudged the data for years.This was national news over the past few days. Have these people no shame? Let’s do a little comparison. Sales were down 138,000 last January, but that was in the vacuum that followed the expiration of the first taxpayer gift to home sellers. That little bonus caused buyers to stampede into the market and overpay at taxpayer expense leaving a vacuum in its wake over the winter. Even so, sales this year were almost as bad at 282,000 vs. 275,000. In January 2009, at the absolute bottom of the crash phase of this collapse, sales were down 104,000 month to month. This year is worse than that. In January 2008 they were only down by 82,000. This year was much worse than that. In January 2007 sales were down by 107,000. Again this year was worse. Somehow, the shameless buffoons at the NAR managed to take this year’s drop of 120,000 and say with a straight face that it was a gain. Here’s another shocker which the NAR conveniently failed to mention in its press release. The median sale price fell to $158,000, which was a month to month drop of 6%! By following real time listing prices, I have been able to warn readers of the Professional Edition Housing Report for months that prices have been crashing since last August. The NAR data is finally catching up. This is the lowest level that prices have been throughout this collapse. Prices are now down 13.2% from the June peak when reported prices were distorted by the taxpayers gift. It is a disgrace that this price distortion was barely discussed at the time. I was screaming about it. As an old real estate appraiser, I knew that once the tax credit was removed the recorded prices would collapse. The price that buyers would pay never changed. The higher prices reported last summer were completely bogus, an illusion. Now price has returned to trend, and seems to be gaining downward momentum. Total inventories fell month to month as they always do in January. People generally start putting their homes on the market in February. Total inventory was 3,380,000 units. This was more than last January when 3,277,000 units were reported to be on the market. 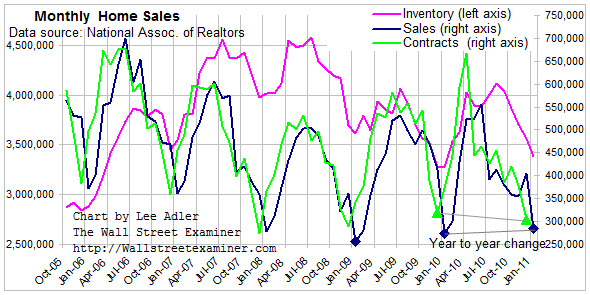 The inventory to sales ratio was 11.9, the same as last year. That means that there were nearly 12 houses on the market for every house that sold in January. A better measure of inventory is inventory to contracts, since it matches what is available at a given time to the number of purchases made in that time period. 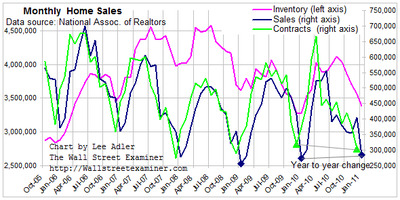 Inventory to closed sales figures represent a 2 month mismatch. The inventory to contracts ratio in December was 11.7. That compares with 10.26 in December 2009. It therefore appears that, not only is supply on an uptrend, the supply-demand imbalance appears to be worsening. Looking ahead to next month, unless the NAR makes up an even bigger lie, it will have to report that closed sales have collapsed. The contract data for December hit a new low. Contracts were down 21% month to month. Those contracts should show up as closed sales in the February sales data. February is usually the first up month in the cycle for closed sales. If the NAR doesn’t report a sharp decline, you know that it is lying again. It just can’t help itself. that closed sales rose in January, year to year. That’s not credible. Stay up to date with the machinations of the Fed, Treasury, Primary Dealers and foreign central banks in the US market, along with regular updates of the US housing market, in the Fed Report in the Professional Edition, Money Liquidity, and Real Estate Package. Try it risk free for 30 days.